LINX is a Fixtureless Backplane Test System offering an innovative, reliable and easy to use solution for the testing of all backplanes and cable harness assemblies. Slim Intelligent Test Interface (S-I-T-IN) cards are inserted into the backplane and simply daisy-chained together to provide in situ testing of your product Eliminating the need for long unreliable test cables or expensive dedicated test fixtures. Test Programs can be created in minutes via CAD data or LINX self learn facility - this enables LINX to be rapidly configured to test new products. 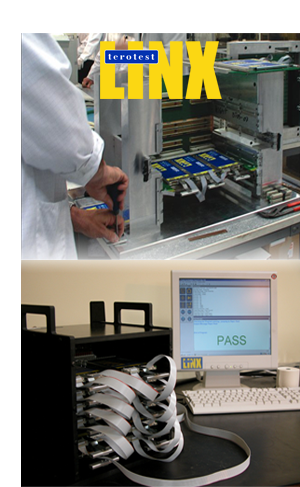 LINX provides a faster, easier and better way to test your products at lower cost. If you have a backplane or cable harness test requirement, LINX from Terotest provides the answer!